Two major projects—one for which work has just begun and another that is in the final stages of being commissioned—are set to make a sea change in the way Cochin Port Trust (CoPT) operates. While the ground-breaking for the Rs3,000 crore international container trans-shipment terminal (ICTT) at Vallarpadam, off Kochi in Kerala, was completed on Monday, the Rs821 crore single-point mooring (SPM) facility for the Kochi refineries of Bharat Petroleum Chemicals Ltd (BPCL) saw the first crude oil tanker berth. The discharge of crude is scheduled to start on Wednesday. A container trans-shipment terminal near Kochi will allow Indian exporters and importers to ship their container cargo directly to and from destinations without depending on neighbouring ports. An SPM is a floating buoy in the sea connected with a pipeline that enables large crude carriers to discharge their cargo without coming to the port jetty. According to CoPT chairman N. Ramachandran, the consortium agreement for the third major project—a Rs3,000 crore liquefied natural gas (LNG) terminal, between the port and Petronet LNG Ltd has been finalized. He admits that the delay has been because of certain rule changes in land lease renewals after 30 years that needed a clearance from the Union government. The matter will soon go to the cabinet committee on economic affairs for approval. BPCL is yet to decide on joining the consortium, he adds. India Gateway Terminals Ltd (IGTL), a subsidiary of Dubai government-owned port operator DP World, will construct the ICTT. The IGTL general manager Suresh Joseph says work on the new terminal would begin in two phases. In the first phase, the annual cargo handling capacity will be for one million 20-foot equivalent units, or TEUs. A TEU is the standard size of a container and is a common measure of capacity in the container business. The work is scheduled to be completed in 24 months. 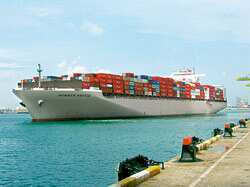 Eventually, the cargo handling capacity would be raised to three million TEUs. Port chairman Ramachandran says work soon would begin to set up power and IT infrastructure at the facility. K.N. Ramachandran, general manager of BPCL, says the first tanker carrying 79,000 tonnes of crude has been berthed at the offshore SPM on a trial basis. The crude will be discharged to a storage tank and then pumped through pipelines to the refinery, 20km from the shore. While the current capacity of SPM is for vessels of 140,000-tonne capacity, by January 2008, the mooring system would be able to berth very large vessels of 300,000 tonne capacity. Ramachandran says that SPM would mean revenue loss to the port. The wharfage or port charges is Rs65 per tonne of crude that fetches the port an annual revenue of Rs65 crore. SPM will bring down the wharfage to Rs25 per tonne, which in turn will shave off Rs25 crore from port’s annual revenue. However, with the capacity expansion of the refineries—from 7.5 million tonnes to 9.5 million tonnes—volumes should grow to bring in higher revenues. ICTT, along with the proposed LNG terminal, and a slew of projects, such as the two port-based special economic zones, should see a renaissance of the port.